Domaine du Pech, owned by Magali Tissot & Ludovic Bonnelle, is a family owned and run domain in the heart of south west France, which focus on Terroir expression, biodynamic processes and crafted quality. Established in 1978, Domaine du Pech is located on the eastern border of the AC of Buzet, about 100km south east of Bordeaux, on the hills to the north of Gascony. 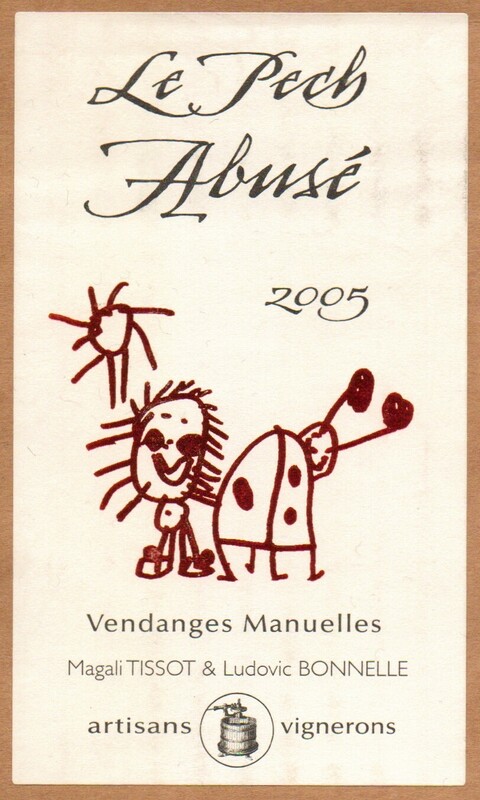 In 1997, Magali and Ludovic took full responsibility of the estate; and in 2003, they adopted and turned the Domaine to biodynamic production. Hence, they produce wines using no chemical interference, whether in the vineyard or winery, no sulfur either, which is a risky strategy, but one they can take due to the high quality of the essential raw components: healthy vines and grapes. The wines are produced from the typical varieties of the region: Cabernet Sauvignon, Merlot and Cabernet Franc for the reds and Sauvignon Blanc for their limited release white. They greatly believe in Terroir expression and each variety is paired to the perfect soil to maximize its quality potential. 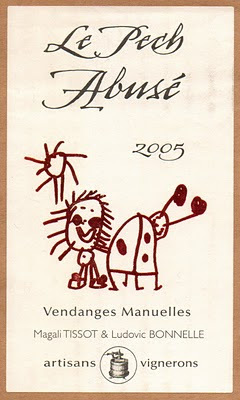 The label art work is designed by their two daughters. A blend of 40% Merlot, 35% Cabernet Franc and 25% Cabernet Sauvignon from hillside vines, which spent about 3 years ageing nicely in very old oak casks (36 month in oak, with pigeage every other day, and fermentation with natural yeasts only), this biodynamic Buzet possesses balance, ripeness and depth. Alcoholic fermentation naturally stopped at 15 grams, no SO2 added at all, and like most natural wines, no filtering or fining before bottling. 500 cases produced. We just received it and I love it. Beside its bright ruby color, it offers expressive aromas of blueberry, blackberry and black fruit, mingled with earthy, smoky and mineral notes. The palate is rich, generous, ripe and super juicy with the same type of flavors as on the nose with oak ageing nuances, enhanced by good acidity and integrated tannins. The finish is quite soft, rounded and really ripe, but not overripe or stewed. Highly recommended. Discover natural, biodynamic red wine with hearty dishes like Cassoulet, Saucisse lentille, Magret de Canard, Braised beef, etc... How not to "abuse" of it, when it is so good? This wine, once again, confirmed my passion for the Southwest of France and its rather undiscovered wines. Being from the Southwest of France myself, I have always been the faithful ambassador of the wines from this area. And surprisingly enough, despite the fact that the 5 top selling wines in the store are French, one of them is a super friendly, crisp and zesty little white, from Gascony, made from two indigenous grape varieties: Colombard and Ugni Blanc. I already wrote about it in an earlier post and will review it again soon. I think its bright ruby color, it offers expressive aromas of blueberry, blackberry and black fruit, mingled with earthy, smoky and mineral notes. I would like to taste their wine. I think there's a market for wine that's produced without any chemicals at all. It helps that they are so careful with selecting the best quality grapes and also use natural predation. That explains the label.